Your union will keep you updated about HB 53 and how it impacts your work. Keep checking our website for critical information and how you can help stop HB 53 from becoming Ohio law. OAPSE members remember the Senate Bill 5 fight like it was yesterday — but in fact it was seven years ago. Republicans in the state legislature passed right to work legislation that would have gutted our collective bargaining bill and destroyed our ability to negotiate with employers for our wages, benefits and working conditions. What followed was one of the most epic ballot fights in the history of Ohio, as OAPSE and all of organized labor joined together to defeat right to work (Issue 2) by a margin of 62-38. You would think those lawmakers would learn their lesson — but NO! State Rep. John Becker introduced HB 53, which brings Right to Work back to the statehouse. The bill will have a hearing Tuesday, November 13 at 1 p.m. in Committee Room 313. Right to work is wrong. 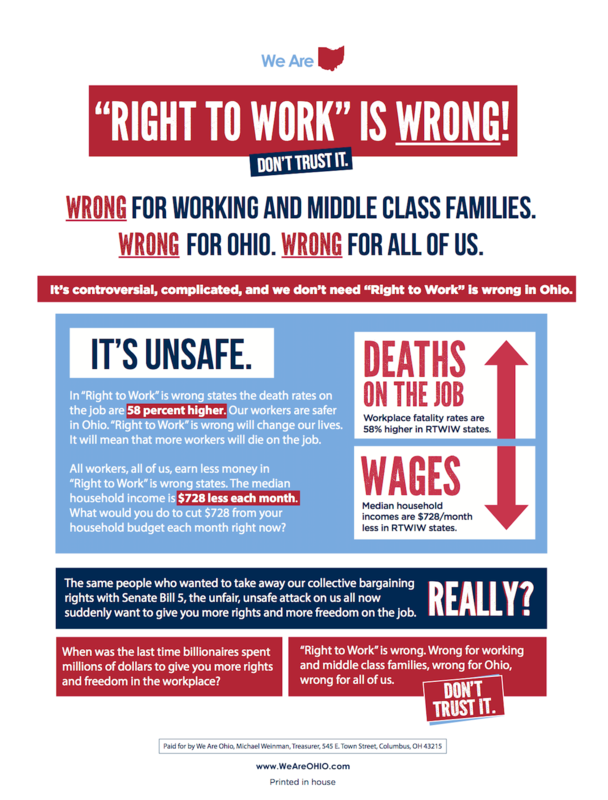 Wrong for working families, wrong for Ohio, wrong for us all. We can’t trust it. State Rep. Becker’s legislation is dangerous and destructive. 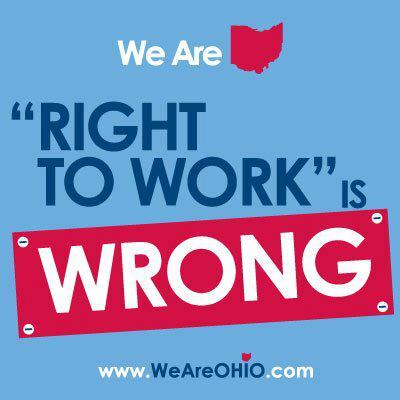 Right to work is complicated and controversial and we don’t need it in our state. In right to work is wrong states, workers are paid less on average $728 a month less than in free bargaining states like Ohio. What would you do if you had to cut $728 a month from your household budget right now? That’s Rep. Becker’s plan. In right to work is wrong states, workers are less safe. The death rate on the job is 58 percent higher. If state Rep. John Becker has his way, more people will die on the job in Ohio. State Rep. Becker’s plan will make all of us poorer and less safe. Right to work is wrong because it doesn’t create jobs. Workers don’t want this. Rep. Becker is carrying water for the Koch Brothers who want to make us all work for lower wages and with less safety on the job. Rep. Becker is working for the same people who tried to take away our collective bargaining rights with Senate Bill 5 and Ohio voters said no to that idea by a 62-38 percent vote.